Our Adjustable Work Platform can be used in alot of different applications. But this model’s primary use is to access mobile trailers or something similar. These platforms have 9″ of adjustablity in 1/4″ increments. Aluminum Construction is standard, but they can be constructed in steel. If none of these dimensions fit your application, we can customize the platform to your specific needs. 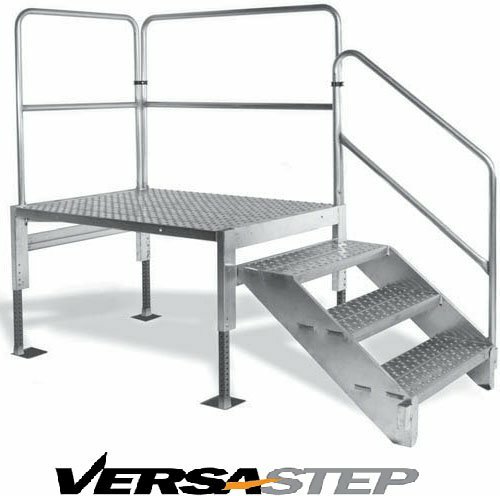 The Adjustable Work Platform is one of the most widely used platforms we offer. Simply, because you could literally use it on thousands of different applications. The most common application would be to use it along side of a modular trailer, either for home or for work. They are usually placed on the side of the trailer, so an individual could access the elevated door. Since most trailers are different, this platform is configured to be adjustable. It could range from 25 inches to 67 inches. The platform also contains some steel galvanized legs, to resist long term resistance to extreme weather conditions. For example, your job site may need to be up throughout the winter and summer and sometimes for years on end, depending on the project. Along with the aluminum construction, it could withstand all kinds of weather. To get more detailed information along with any cut-sheets or drawings needed to make sure they would fit perfectly with your job, just give us a call directly toll free at (888) 722-0311 or email our sales department at sales@usindustrialsupply.net .